Above, Charleston A.T., Amos Stowe’s creation, before its decline became irreversibly rapid. This image is cropped from a C.S. Fly photo, a copy of which contained within the collections of John D. Rose. Sepia tone has been digitally added to this and other images in this article, making the photo appear more like the original would before it was copied into black and white, most likely in the 20th Century. Blowing smoke is seen at the far left of the image. This is the Corbin Brothers Mill at Millville, just across the San Pedro River (which cannot be seen in the image given its lower elevation) from Charleston. Charleston owed its existence to the jobs and wealth created by these two stamp Mills, which turned raw silver ore from Tombstone’s rich mines into bars of silver bullion. 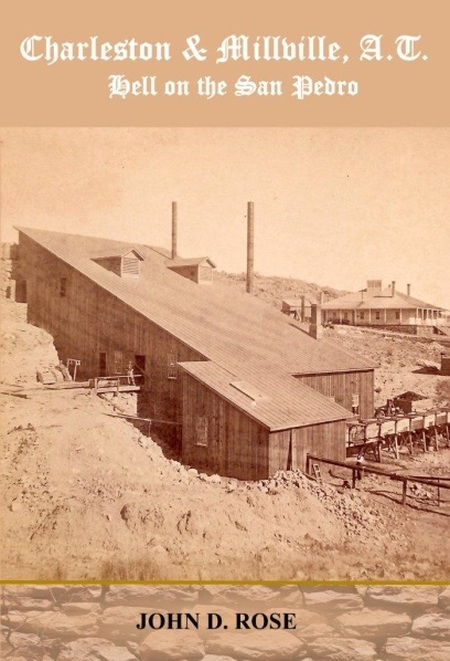 The ore entered the Mill at its highest elevation, and the bullion exited the Mill at its lowest elevation. 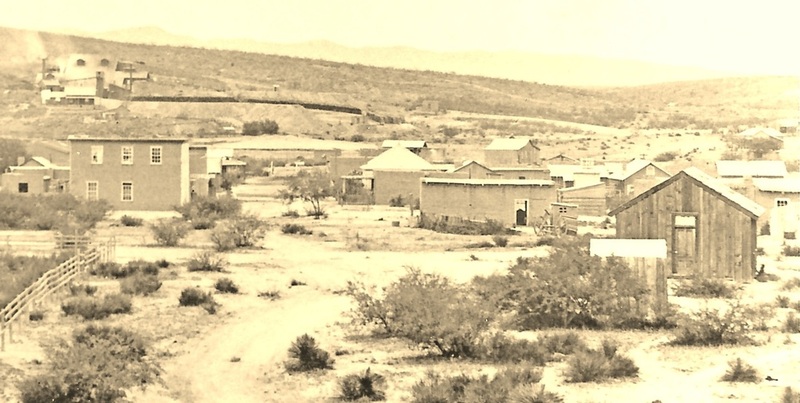 All major stamp mills in the Tombstone District were constructed on the East side of the San Pedro River, and Tombstone was located miles East of the San Pedro River as well. This allowed the teamsters the safety of not having to cross the sandy bottom of the San Pedro with a fully loaded down wooden ore cart. It is incorrect to conclude from this that the San Pedro River was so full of water that it made this necessary. (Then, just as today, the San Pedro only fills with water after substantial rains across the Valley drain into it.) Rather, the weight of an ore wagon, coupled with the softness of the river bottom, even why dry or nearly dry, made sinking a real problem. This area of the river, between Charleston and Millville, was also plagued with patches of quick sand in some areas, was deep enough to drown a horse. The left side of the previously pictured C.S. Fly photo of Charleston. 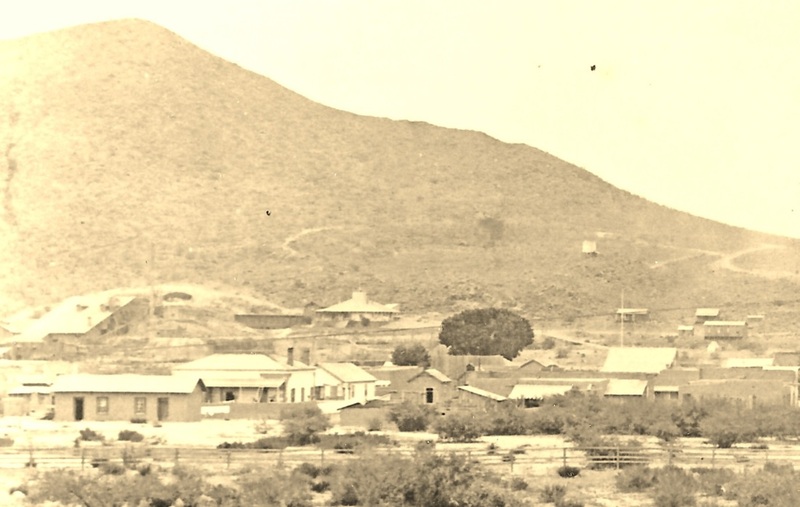 Richard Gird’s house is visible across the San Pedro River at Millville, as is his Mill at the far left. The Gird’s house can be seen just to the left of the large and lone Cottonwood tree. Note that there was only ONE Cottonwood Tree at Charleston pictured in the 1880’s. Today there are countless Cottonwood’s in this area. This photo clearly proves false the voluminous and chronic claims that the amount of Cottonwood Trees today along the San Pedro have always were there in the historic period. In their current quantities, they are a 20th Century occurrence, and not at all a 19th Century one. Pioneer Street in Charleston. The hill in the background borders the town site on its northern end. Additional close ups of the photo follow for enhanced viewing. Above, a cropping from the far left of the image from the previous page. Note the blurred flag flying not at full or half mast. At exactly half-mast the flag would have unacceptably touched the building. So it appears to have been raised just enough to clear the building, but at the same time remain far enough below full mast. This may indicate that on this particular day, Charleston was honoring some sort of official mourning that was taking place. The blurring of the flag implies that there was a breeze strong enough to blow the flag toward the west. Because of the more lengthy exposure time due to cameras of the day, it’s not surprising that movement by people or things would sometimes appear blurred as does this flag, but not the person to the right, who appears to be standing still for the photo. By further cropping this image, and making additional contrast and brightness and other adjustments, some of Charleston’s citizenry become visible along the west side of Pioneer Street. Now for the right side of the street from the same image. The man viewed in the white shirt who is standing still has been left in both images as a reference point for viewing and understanding. To his right two other men appear to be knowingly participating in the photo as they face the camera in the distance. Note the doorway on the right with bunting on it, which may relate to the flag at half-mast. The third building with the lighter façade is owned by the photographer of the images, Charles Farciot. Below is a closer in photo of the same building, Farciot’s building in Charleston, located on Lot 6, Block C, Pioneer Street, near the corner of Third Street. Farciot’s fellow Tombstone District photographer C.S. 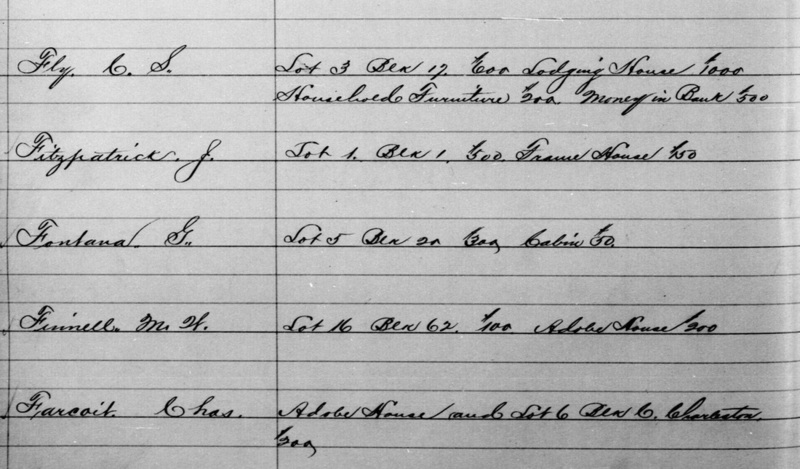 Fly is viewed at the top of the cropped image from the 1882 Delinquent Tax Roll for Cochise County. Farciot, misspelled as Farcoit, is viewed at the bottom. This is his only appearance in the roll. The photo of his building matches the location of Block 6 in Charleston, as Block’s A, B, C, D, were on the far eastern side of Charleston, nearest the San Pedro River. The photograph and the Charleston plat map confirm no organized streets to the east (toward the river and Millville) of Farciot’s building. Tax roll image courtesy of Kevin Pyles, Cochise County Archives. Based on the location as designated in the 1882 Delinquent Tax Roll, Farciot’s building was located on lot 6, block C, on Pioneer Street. The story of Charleston begins with Amos Stowe. Stowe took note of Richard Gird’s stamp mill that would soon be followed by the Corbin mill as well. But Stowe was quick to seize the opportunity before him. Seeing that silver milling along the San Pedro River would supply men with money to spend, a nearby town site was inevitable, and Stowe decided to be its founder. Millville as it was named, would supply jobs on the east side of the San Pedro River, and Stowe would supply a town called Charleston on the west side. In recent real estate vernacular, Stowe offered a “no money down” approach to those who wished to settle on his fledgling community. 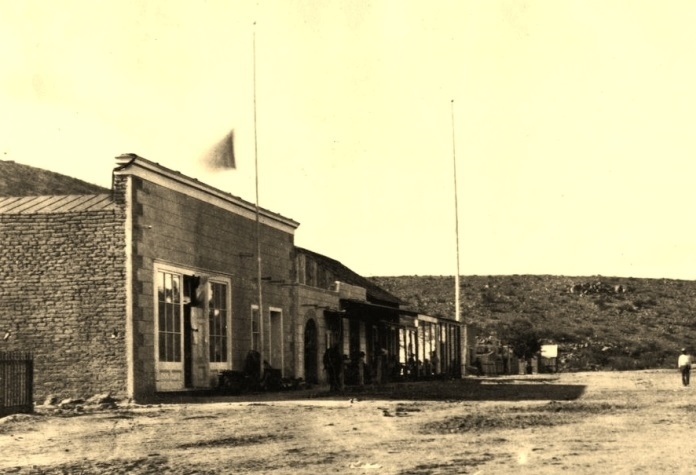 It started on October 28th, 1878 when Stowe recorded a claim for a relatively flat quarter section of land (160 acres) for grazing and agricultural pursuits, but it was no coincidence that the site was perfectly situated across the San Pedro from the beginnings of Millville. Once Tombstone surveyor A.J. Mitchell completed his survey in February of 1879, Stowe busied himself by offering lots free on a three-year basis. (Mitchell Street in Charleston was named in the surveyor’s honor.) The condition attached was that the lessee had to make $100.00 of improvements to the lot within a time frame stipulated by Stowe. Following the third year the lessee was then required to pay Stowe the value of the lot, including improvements. This allowed those wishing to build in Charleston the freedom to spend capital on their buildings without budgeting for the land on which they were building. Amos Stowe’s claim for the land that became the Charleston town site. Among multiple points of reference, Stowe’s claim includes lesser as well as long-term markers, referring to a “Mesquit[e] tree or bush about one hundred feet Northerly from the present crossing of the San Pedro River on the Western bank and nearly opposite the Mill Site now owned by Gird, Schieffelin and others…” Stowe ironically refers to the Gird Mill. It may be that his frayed relationship with Richard Gird in part helped lead to the financial downfall of his retail store, his own finances generally, as well as his loss of ownership of the Charleston town site. 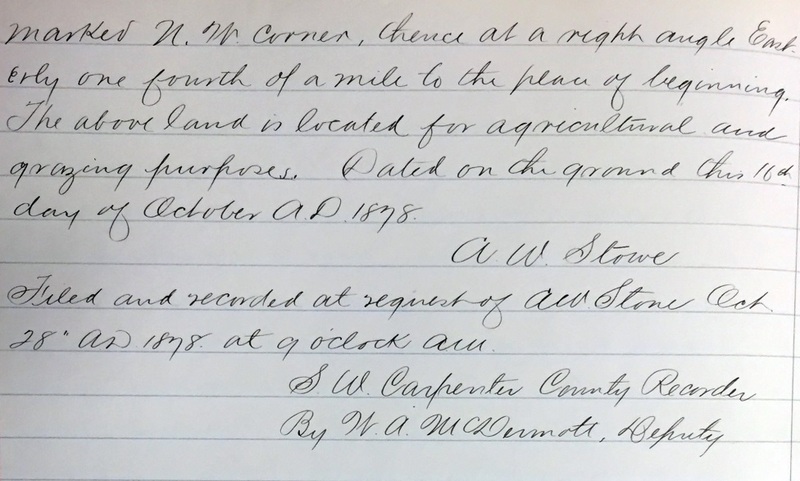 These documents are found in the Transcribed Book of Land Claims, located at the Cochise County Recorder’s office, ably run by Christine Rhodes. Photos of these documents courtesy of Kevin Pyles, Cochise County Archives. The above image is cropped from the Charleston plat map, showing both Mitchell Street named for its surveyor, as well as Stowe Street named in honor of Amos Stowe, Charleston’s Founder. For Stowe, a money-down policy may have been wiser to assist with other financial obligations; on August 14, 1879, less than seven months after the Charleston survey, Stowe had to surrender his Tombstone and Charleston properties to creditors. Zeckendorf and Company, a Charleston general merchant, won a judgment for $4,028.00, and Stowe’s troubles were by no means over. Pima County Sheriff Charles Shibell would soon auction his assets in hopes of paying off his creditors. Monies from the sale of Charleston and other Stowe properties fell far short of the judgment. 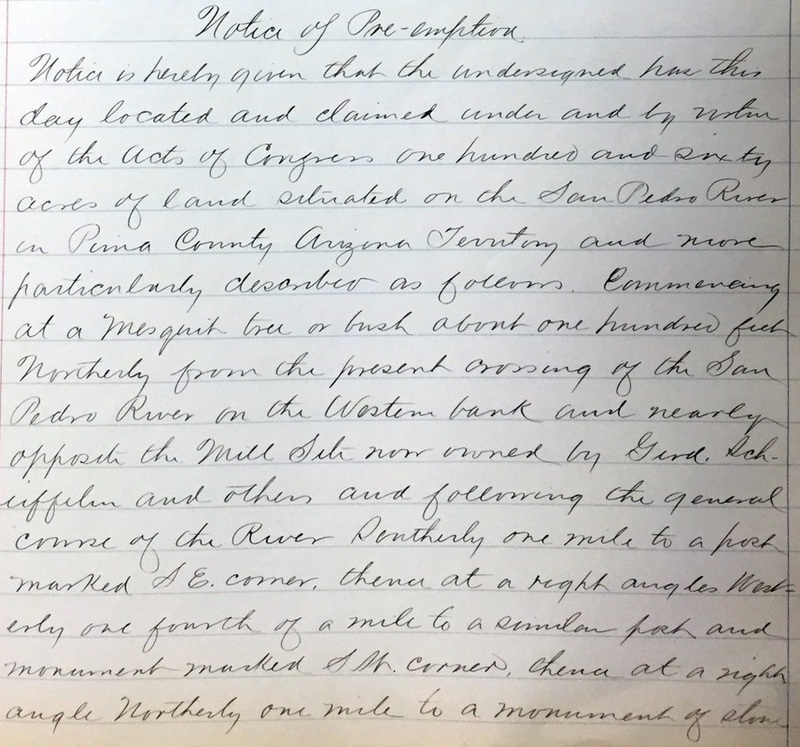 Oddly, the Charleston town site was sold on August 24th 1880 by Jim Burnett, and then sold the following day of August 25th at public auction by Sheriff Shibell. Newspapers were very interested in the progress at Millville and other milling sites and kept the public abreast of new developments. Charleston founder Amos Stowe paid a visit to the office of the Tucson Citizen, and gave updates from Tombstone and Charleston. “By the arrival of A.M. Stowe we learn of the matter in and about Tombstone. Jim Burnett, a questionable Judge from Charleston, noted Stowe’s relationship with Charleston’s most well to do customer, Richard Gird, of the Gird Mill at Millville. “Mr. Stowe and Gird were not on very good terms. I think there was some trouble about mining claims.” This was yet another financial setback for the cash strapped Stowe. Given that Millville was one of the best customers in the area, the portion of Gird’s budget spent locally could have helped him stay afloat financially. A former child of Charleston, Edith Dorsey, recalled her time visiting the Stowe family and playing with their daughter. Edith Dorsey continued her memoirs in her letters to Mrs. Macia. Of her Charleston memories she wrote, “…my maiden name was Edith Johnson. I lived next door to the Stowes, and little Edith was my little pal and play fellow…Edith and I spent most of our days in each others company, she at my home and I in hers. Her Mother always smiled at us in our play-for it being quite hot outside we had to play much of the time indoors [occasional stray bullets instead of the heat may have been their parent’s real reason for inside play]. As I recall it, Edith was rather delicate in health and had to be humored a great deal, but such a dear sweet child.” Of the family of Charleston’s founder, the Stowe’s, she added, “They seemed to be a rather exclusive family…” With his financial collapse, Stowe would quickly find himself not only Charleston’s founder and very first pioneer, but also one of its earliest financial causalities. But Stowe’s collapse was but a precursor to the town’s later demise but a few years later. The above information is in part excerpted from “Charleston & Millville A.T. Hell on the San Pedro, by John D. Rose. This is the first and only book ever published on Charleston, released in 2012, that chronicled the rise and fall of Stowe’s creation. For more on this remarkable story and far other research breakthroughs, this book is available at https://www.createspace.com/3758160. It can also be purchased on as well as Amazon.com. Copyright John D. Rose 2015, 2016, 2017, 2018. All rights reserved.